In the world of international development Amartya Sen’s capability approach is well known, especially for its adoption by UN policy makers to formulate and justify the Millennium Development Goals and their successor set, the Sustainable Development Goals. The MDGs have been criticized for lacking an economic underpinning of the health, nutrition and education objectives, thus leading to unsustainable development. Having a background in international development myself, be it mostly from an agricultural perspective, I wanted to see if this critique was fundamental to the capability approach itself or whether it was just in its application. I picked up a serious introductory overview paper (Robeyns 2005) and produced a concept map (below), which I will describe. At the end I will add a few comments from the systems approach perspective. Amartya Sen … is an Indian from West Bengal. He was born in 1933 on the campus of a university, where his father was teaching. The university had been founded by Rabindranath Tagore, who was the first non-European to win the Nobel Prize in Literature (acceptance speech), and who gave Sen his first name, Amartya, meaning immortal one or immortal soul. Sen became a Nobel laureate himself in 1998. His Nobel lecture about social choice theory can be found here. The theory of social choice asks whether it is possible to find a rule that aggregates individual preferences, judgments, votes and decisions in a way that satisfies minimal criteria for what should be considered a good rule (i.e. of a ‘good society’). The capability approach provides a theory for seeking an answer to that question. The capability approach (#B) … is dealt with in the red box. The basic mechanism is depicted in the top two rows. It all starts with a production apparatus (‘input production’) which supplies a range of goods and services that enable individuals to develop a set of capabilities from which he or she can chose to achieve certain functionings. These functionings are an express of what a person desires and can range from working to being healthy and from being part of a community to being respected within that community or the society at large. A large number of factors affect what capabilities a person is capable of, including policies, social context and personal characteristics. Martha Nussbaum …. 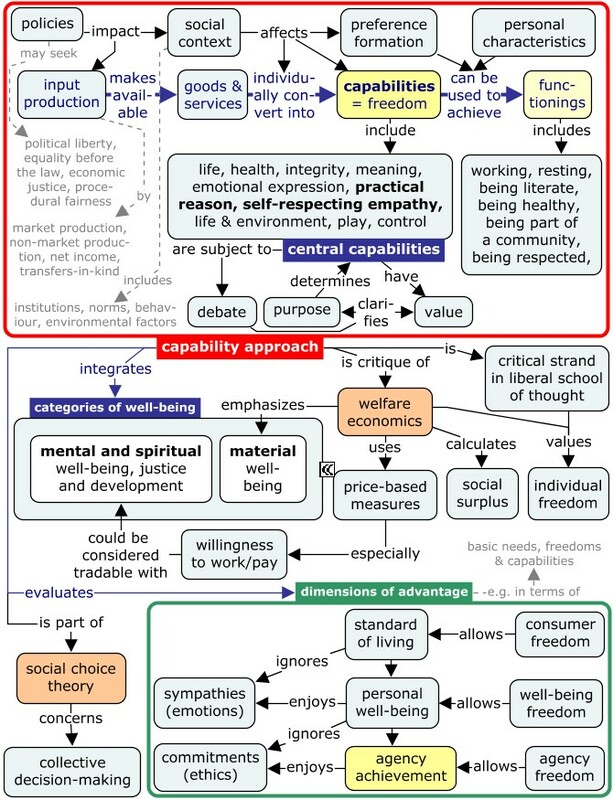 has given a twist to Sen’s capability approach by defining ten central capabilities, including life, health, integrity, meaning, emotional expression, practical reason, self-respecting empathy, life & environment, play, and control (for full description, see Internet Encyclopedia of Philosophy). Sen preferred not to define such a list, leaving the debate about them open for each situation. In the end it is the purpose that determines which capability has value and needs expressing. Nussbaum is a very good talker and organizer. I came across a very good talk (“Creating Capabilities: The Human Development Approach” in which she also discusses utilitarianism) here and a very good organization (Human Development and Capability Association, HDCA) here. It is interesting to note that the UK-based Open University is one of its institutional members. Dimensions of advantage (see green box:) Each person has under certain conditions certain advantages or lack thereof. They can be expressed in terms of basic needs satisfaction, freedoms and capabilities and become apparent as functionings. From an analytical point of view it is important at what level these advantages are evaluated, as consumer freedom, well-being freedom, or agency freedom. From a moral viewpoint agency freedom and agency achievement are the most important, because they allow a person to express his or her commitments to the well-being of others. Aristotle, Smith & Marx Sen and Nussbaum were in various ways influenced by Marx, Aristotle and Adam Smith. The latter’s ‘The Wealth of Nations’ is foundational to all free market thinking, which requires individual freedom for markets to function properly. This is very much at the basis of Sen’s capability approach. The Marxist and Aristotelian part is where Sen considers agency to be of the utmost importance to the meaning of human life. This goes far beyond the Pareto principle of welfare economics, even to the extent that agency could be considered of a totally different dimension. The development problem is one of poverty and inequality. In Sen’s words “Development consists of the removal of various types of unfreedoms that leave people with little choice and little opportunity of exercising their reasoned agency.” In this sense the capability is about opening opportunities for agency rather than locking them in. The larger framework remains that of the market not government control. Participation and empowerment … are two terms that are often used in the modern development narrative. The question is: participation in what, empowerment to do what. Progress in the South is anything but simple if it has to be part of a cumulative process of sustainable development. It is unavoidable that in each situation advances must be made in terms of a mutually reinforcing set of development goals for such an effort to be in some way sustainable. It is the consideration of multiple goals that turns almost any such effort into a systemic one. The systems approach What Sen calls ‘reasoned agency’ then becomes the type of reflexive planning that has been described by C. West Churchman as a dialectical systems approach. Empowerment, in this (and my) view, is the application to a fairly specific local development challenge of the dialectical systems approach, which is not purely rational but contains necessarily political, moral, and aesthetic qualities. Participation is the dialectical aspect of it, provided, of course, that the beneficiaries of the development are themselves involved in the dialectics. Not just as beneficiaries, but also as co-planners and co-decision-makers. Perhaps I should add, as co-systems-thinkers. Churchman intended his systems approach to be of a general nature to get as broad an understanding of management as possible. Management is about justifying decision-making in complex situations. 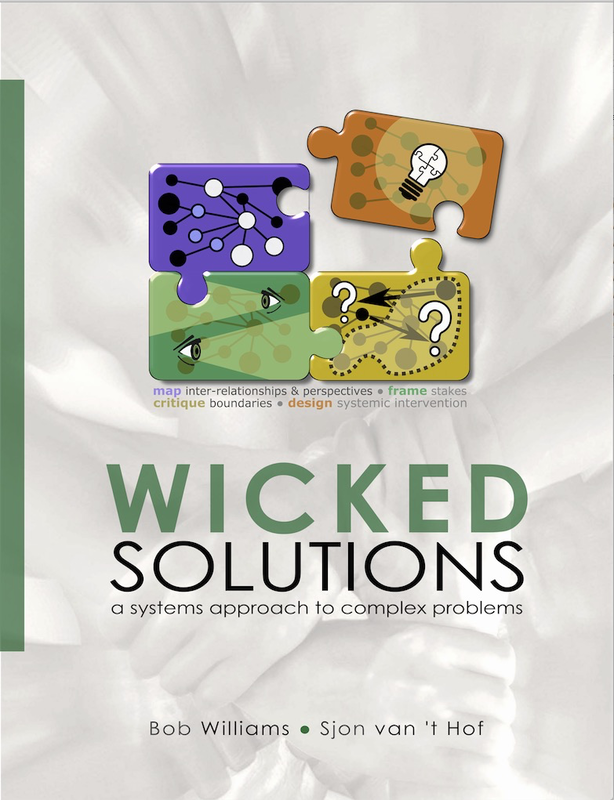 As a result of its generality the dialectical systems approach can provide a framework for unfolding the more intricate details of the capability approach or some other comprehensive approach for informing collective decision-making.